Well the danger of frost is finally done, or is it? Just this morning on the news I saw that northern Wisconsin might actually get frost tonight. Since I am not in northern Wisconsin, I decided to sow my remaining 'Spitfire' seeds for the seed GROW project. I mixed them with 'Grandpa Ott' morning glory seeds, as I figured the purple of 'Grandpa Ott' might be a good contrast to the red/orange of the nasturtium. The seeds I planted in March and covered with my pop bottle cloche continue to grow, despite critters and weather working against them. The day after I snapped the picture of the nasturtium last month a critter, guessing a chipmunk (the same one who ate my tomato plants probably), dug the cloche off of my nasturtium. This was the night it decided to snow. It had been in the 80's that week, and then by Friday it was 30's and snow. 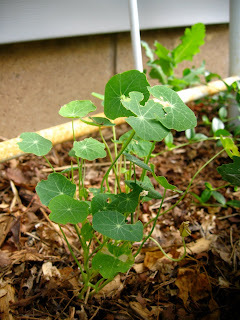 So my nasturtiums were exposed to the elements, but they were tough and fought through it. I am jealous of the other bloggers who already have blooms, but in the past my nasturtiums haven't even bloomed until mid-August. That color combo would indeed look nice. Good luck with the remainder of the seeds and I hope you don't get any crazy late frosts. LOL, You never know with Wisconsin weather! I'm not too impressed with the growth habit of 'Spitfire.' Maybe I'm more used to vigorous viners, ones that can clasp and grasp on their own without help from me. If 'Spitfire' is a true climber, it'll climb without assistance, if not, I'll not help it and it'll be a trailer in my garden. I'm growing it more to eat anyway. I forgot to ask, just what is "Cheesehead Gardening" anyway?